This is Robert LeFevre's magnum opus work of over 25 years. "Government is a group of people who sell retributive justice to the inhabitants of a limited geographic area at monopolistic prices…Politics is the method employed in the power structures by means of which a monopoly of coercion can be obtained and maintained… This is what we can do without in the interest of law and order." 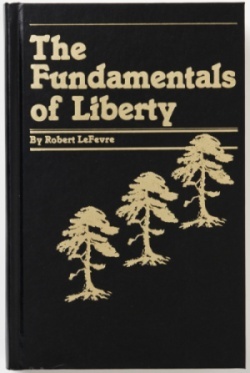 Considered the definitive work on the nature of liberty, Mr. Robert LeFevre's The Fundamentals of Liberty is a combination of over 25 years of work as a lecturer, author and president of Rampart College. The book took five years to complete and was finished only a few weeks before his death in 1986. Viewed today as one of the founding fathers of the modern libertarian movement, LeFevre was a major influence with campus libertarians during the turbulent 1960's. His philosophy on ownership, the nature of man and his government sent shock-waves throughout California and eventually the world. Some of his chapters titles include: The Industrial Revolution; the Robber Barons; Epistemology; Property and Ownership; Early Man; Socialism; Communism; Wealth; Banking; The American Story; The Declaration of Independence; Freedom; Withdrawal of Sanction; and more (34 chapters), hardbound, 487 pages. Price: $24.95 and $3.00 for shipping and handling.